When I originally finished A Darker Shade of Magic I wasn’t 100% sure I was ready to commit to this series. It took me awhile to realise I actually liked it. But like it, I do. In fact this entire series has me smitten!! V.E Scwhab has a way about with words, not in that she writes in beautiful, lyrical prose, but in the way she builds her world and characters. In a lot of fantasy novels I’ve read, the world gets bigger and bigger, expanding continuously as the series progresses. It does get a little harder to remember places and their names, and referring to the map constantly can be tiring. That’s probably why I love how Schwab has constructed the world, making it big enough to encompass plot progression, but not overly extravagant that it has to include 2 continents and a galaxy far away. Instead, she builds strong foundation for the 4 Londons, different in every way, with rich and very believable history. Schwab’s strength in writing also translates to her characters. Each character is unique, carrying their own voice and back story, which makes it easy to connect. 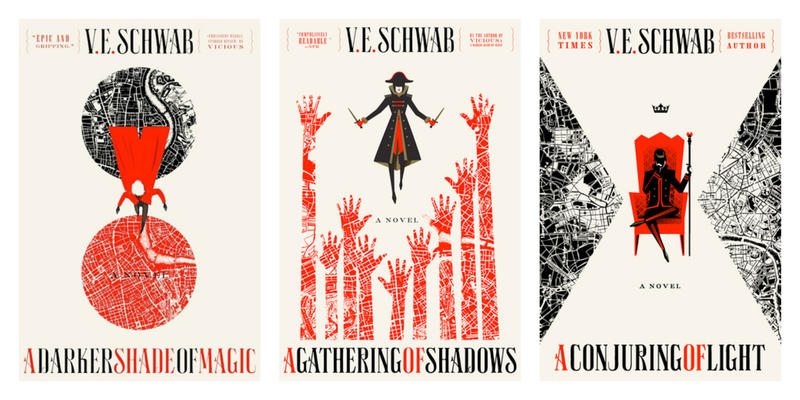 It’s very rare that I find every character memorable, but Schwab makes sure that each person she introduces has a purpose in the series. Whether it was a minor or major character, they all played a part in driving the plot. The thing I loved most though, was that Schwab created characters with depth. Sure, you have your decided villains vs. heroes, but I started noticing a lot of grey occurring. What I mean is that Schwab was trying to imply that there is no definitive line between good vs. bad, and you could see that each character had flaws that either made me realise not everyone is perfect and those who come across as “bad” can be empathised for. Shades of Magic biggest strength though, is its continuous story line. True, each novel has a different problem that needs to be resolved, but there all interlinked and stem from the original situation that occurs in ADSoM. It was so easy to keep up with the plot and what was happening because, as a whole, the series had one purpose. I find a lot of fantasies tend to steer left and right with mini challenges for the characters before it ultimately becomes so different to what was originally introduced. SOM knew where it was heading and did it convincingly. Schwab’s has produced a creative and gripping story, easy to fly through and really immerse yourself in the world and its characters. I grew attached to the characters and the world itself, wanting to experience it first hand. The series wrapped up satisfyingly, and A Conjuring of Light was probably my favourite read of the three.